In 2016, the couple Grazielle Rodrigues and Pedro Pierre decided to start running a hostel on the Island of Fernando de Noronha. Users of the hostelling system, they took the decision to set their hostel in a colonial house, located in the centre of Fernando de Noronha, and is part of the Island's Historic Patrimony. The house was completely renovated to welcome anyone who comes to know the island in a different way. We are located in the centre of Fernando de Noronha. Vila Hostel is located in the neighbourhood of Vila dos Remedios, historical part of the Island. You can be engaged in various activities, such as snorkelling, cycling and hiking. The hostel also offers bike hire. Vila dos Remedios is 200 m from Vila Hostel, while Santo Antonio Port is 1.4 km from the property. 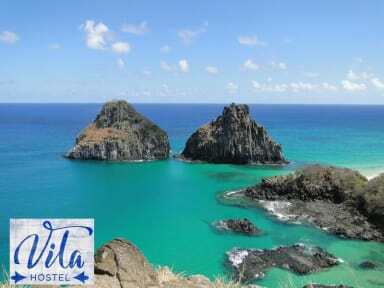 The nearest airport is Fernando de Noronha Airport, 2 km from Vila Hostel. The hostel offers shared and private rooms. All rooms are fitted with a shared bathroom. The house has 5 rooms: three bedrooms, one of them shared and with beds type bunk beds, accommodate up to 6 people. Two private, for up to three people, equipped and shared kitchen, 1 bathroom with shared hot shower. In addition, Vila Hostel has a small hall and outdoor area so that guests can enjoy a good chat and get to know each other. Check-in time is from 2 pm to 5 pm. Excelente Hostel, os donos Grazi e Pedro, e a gerente Bruna são ótimas pessoas, me fizeram sentir como se eu fosse um membro da família. 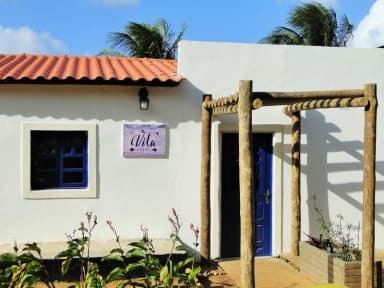 A localização do albergue é excelente. Recomendo, da próxima vez que for para Noronha ficarei hospedado no lá novamente.